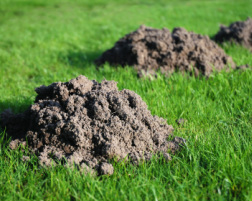 We are Oregon City mole trapping professionals and can handle your problem quickly, stopping the damage caused by dirt mounds. The first thing alot of people do when they notice they have a mole problem is go to the store and buy some poison, whether its a smoke bomb or the cheap pellets some stores sell. We have found that those have very little success and have been called to clean up yards that have tried them. The best way to solve a mole problem is to trap them. We have been solving these kinds of problems for years and know how stressful and frustrating they can be when they are in your yard. We do not only service residential properties, but are able to solve large commercial jobs as well. Gopher's are most commonly found in rural fields or large grass fields on commercial properties. The gopher's can take over a field very quickly creating a huge mess and killing alot of the grass. 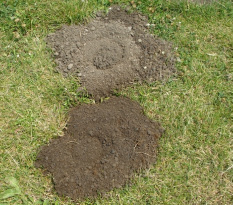 They are much larger than moles and move alot more dirt because there tunnels are so much larger. They mainly eat plants and vegetation, so they are usually responsible is something is tunneling under your garden and destroying you crops. We have traps that are made to just to get the gophers we have around Oregon, which happen to be some of the largest in the United States. Most people do not know what to think when they first see vole damage (as shown in the picture). It is because most people have never heard of a vole before. They are very similar to mice physically, but are tunnelers that often move into areas the moles and gopher have been before. They use the old tunnels as highways and create small golf ball sized holes to come out and feed. They also cause alot of damage by wearing down trails that kill the grass. We are able to come in and trap the voles helping to stop the damage.